You’re a freelance writer and you probably have a blog. Is writing on your blog a priority? Or, do you find yourself forgetting to update your lonely blog and deciding to ditch writing on it altogether? I know. It’s hard when you suddenly become flooded with client work and deadlines. For me though, I do my best to update my blog on a weekly basis, and if I can’t then I become a little creative. February was a busy month so I decided to interview successful freelance writers, thereby giving me more time to write for my clients, but making sure my readers get fresh new content! A win-win! But, what if you are just too busy, or what if you don’t think you need a blog to land clients? If you are one of those freelance writers that neglects your blog, you’re going to want to change your perception about it. As a freelance writer, you have the opportunity to use your blog to help you land clients. Not just any clients, but high paying clients. I mean, this is free advertising right? Your entire freelance writing website has to showcase your best writing and what better way to do this than with a blog that has consistent content? The trick is to know what to write about and demonstrate how great of a freelance writer you are. So let’s uncover the formula to attracting clients with your blog. 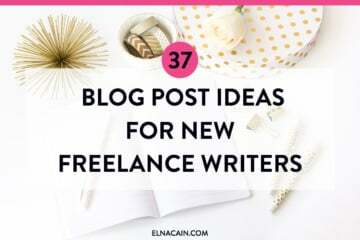 Although you may feel like writing about other things such as your day-to-day musings, if this is your professional blog, let’s keep it focused on your business and what you can provide as a freelance writer. This is not to say you can’t have a personal blog. Many freelance writers do, like Lisa C. Baker, a freelance writer and supermom. She has a personal blog filled with stories about being a mom. But, for many of us, when choosing to have a professional blog, there’s only three areas you can focus on. If you decide to focus on a niche topic for your blog, this helps develop your credibility as an expert in your niche. It also helps new freelance writers build up their portfolio when they may not have any clips to showcase. When you develop a niche blog, you tend to really focus on your blog, essentially putting your blog first. For example, Michelle’s blog, Making Sense of Cents, is a financial blog. On it, she helps other people find ways to make more money, save money and budget, all the while working on her life to do the same. She isn’t a freelance writer, but because of her blog, she has ongoing freelance writing clients. You can turn your blog into a business by monetizing it. Running GoogleSense Ads, affiliate ads or even writing sponsor posts can help you earn a little cash when you find yourself without any client work. If you feel you want to focus writing on your niche topics for guest posts, then use your blog to provide top quality information on writing, blogging, marketing or anything associated with being a freelance writer. By writing about your profession, it has the added benefit of not only drawing in other freelance writers who are eager to learn about this career, but prospective clients who may not know the benefits of hiring a freelancer. You can also monetize your freelance writing blog, but just not at the same caliber as a niche specific blog. I mean, if you have ads cluttering up your side bar and posts, this could turn off clients, but it doesn’t hurt to have a couple ads and to even do some sponsored posts or affiliate marketing. A great way to help prospects decide if they need a content writer is to use your blog to tell business why they need freelance writers. This not only helps indecisive prospects lean towards hiring a freelance writer, it shows them that you know your way around marketing and how content is valuable for small businesses. Many freelance writers do a mix of freelance writing tips and business tips. For example, Alicia Rades has great posts on why business need a blog, but also writes about tips on how to freshen up your blog posts. KeriLynn Engel has posts on how to find quality freelance writers and how to maximize SEO strategies. So, now that we covered what you could blog about, how can we use it to get you some clients? As your freelance business grows and you suddenly have too much work on your plate, you may start to lose focus writing on your blog. You must remember, though, as a freelance writer, even though you have enough work for this month, it doesn’t mean you’ll have the same amount of work next month. Hold yourself accountable and schedule your blog in your agenda. You may want to create an editorial calendar. WordPress has an easy calendar to use and it’s free. When clients see that you update your blog frequently, they can infer that if they hired you, you would do the same for them. Lauren Thrap of Little Zotz Writing, landed a marketing gig on a TV mini-series because she consistently wrote on her blog. And it was her personal blog, not her professional blog! So it goes to show, not matter what you really write about, as long as you keep updating your blog, people will notice. Once you treat your blog like a client, start to add passion into your blog posts. Writing for a living can be monotonous at times. I mean if one of your clients is the owner of a refrigeration and packing company, your posts aren’t going to be all that exciting. Having your own blog allows you to stretch your writing wings and write about what you truly want to write about. And when you have passion to fuel your writing, your blog posts will stand out to prospects pursuing your blog. Adding vibrant images can connect to the audience in a relatable and engaging manner. It also help convey what you are writing about. Prospective clients will recognize your passion and will seek you out to duplicate this on their blog or website. Use stories when writing your blog posts and make it personal. This is a great platform to be a little spunky, comical or whimsical when you write. I recently had a local prospect contact me and said after reading a few posts on my blog, they could tell I had a colorful and fresh take when I created content. I was flattered and hadn’t realized my blog posts generated that feeling. Having a blog is a great way to boost your business and develop loyal readers while at the same time attracting prospects. As a writer, your blog helps develop your niche and improves your writing. People take notice when they see a well developed blog that is consistent with a freelance writer’s brand. It doesn’t hurt either, to have sharing buttons and comments on your blog. This helps clients see that if your content is share worthy and highly engaging on your blog, then it will also be on their site (if they hire you). Just remember one important aspect of using your blog to attract clients: always be marketing. At the end of each of blog posts, add an author bio detailing your services and the easiest way to contact you. This makes it extremely easy for prospects to know what type of writing services you do and how to reach you should they want to collaborate with you. So before you let your blog build cobwebs, give it a little TLC and use it as a marketing strategy for your success as a freelance writer. Have you given your blog much attention lately? I have a niche blog that is on WordPress.com and therefore free. I created a writer’s website/blog/portfolio thing (on wordpress.org), and I still don’t feel comfortable with it, but at least it can be monetized. My issue is, should I be posting regularly on that site as well? I mean, some writer’s websites are just a simple page for clients to find them. I feel very confused and I’m freaking out a little. I’ve been at this a while and nothing is really happening for me yet. I guess I am also nervous about what will happen now that I’ve “put myself out there” because it feels unfinished. That’s great you have a dedicated site for your service! You don’t need a blog on your writer website. You do, however, need a portfolio page with samples of your writing. This can be blog posts! Or, you can link to your lifestyle blog or personal blog on your writer website if you want. Check out my free courses to help you out, or if you need be successful fast, consider Write Your Way to Your First $1k course. Another great read for me. I feel like I landed on the jackpot of freelancing tips. I’ve read my share of ‘how to freelance’ blogs but I really enjoy the tone and style with which you write, so the info seems to resonate with me more. I really appreciate the ‘What To Blog About’ section. It’s nice to know that my ideas were on the right track! I can’t thank you enough for sharing this!!! Great post. Just got finished responding to your other comment when I was pleasantly surprised with yet another comment! Glad you liked my post. While I haven’t landed too many clients with my blog, I know for a fact it has helped me close the deal. And who knows, maybe they did read my blog and went to my Hire Me page and that was that. Either way, your blog can be an excellent place for samples and to show off your expertise! All very good points. For a freelancer portfolio blog, I’d suggest focusing on writing about things in your niche and things that your clients are struggling with. That way, it’s all about what your clients want to read (which makes you look good). You made a great point. Your portfolio should reflect what type of writing you want to get paid for. If you find that you have many parenting articles in your portfolio, but you suddenly became interested in career advice, then make sure to hide your parenting articles or place them lower on the page (if you want career advice clients). For me, that’s what I did. I enjoy writing about social media and digital marketing, so I made sure to highlight those in my portfolio, while placing education last. I’ve been trying really hard to post regularly on my blog lately, because not only does it showcase my writing skills, but it also keeps driving traffic to my site. I find there’s a fine balance between keeping a blogging schedule and then writing something mediocre just for the sake of stick to said schedule. It can be tough to balance blogging on top of client work, marketing, emails, etc! Hi Robyn! Thanks for stopping by. I always love to see new faces on my blog. I totally agree with you! You don’t want to put out “junk” content just for the sake of sticking to your blog content. Treat your blog like one of your clients. Would you give them junk? I wouldn’t. But, it is a fine balance. I feel if I produce a blog post less than 1,000 words, it isn’t up to my standards. So, sometimes I struggle with this as longer posts take more time, research and thinking. But, you just have to be a bit creative. You can offer guest posting on your blog or do a blog series, where you may write less but overall, you’re providing valuable information. I’ll be sure to check out your site! Great blog tips, Elna! I know how easy it is to put your blog on the backburner when you’ve got clients to deal with, it’s a struggle for me all the time. You do such a great job over at your blog Kelly! I think the biggest thing is to committing to a blog schedule that won’t interfere with your client work. For me, I like to post once a week as this, so far doesn’t get in the way of my client work. There will be times though, when I’ll be swamped and my blog will suffer. But, I hope to have pre-written some posts or have someone do a guest post on my blog. It’s encouraging to hear that a constantly updated and promoted blog can help lead to freelance work. I’m just starting my hunt, but I am very anxious to dive in and start writing. I like your suggestion to treat a blog like a client and schedule deadlines. I might suggest keeping a list of prompts. While I can’t always drop everything and write on every idea, when I get my chance to write for my blog, I can jump into an idea right away as i have about twenty topics waiting to be written. As a freelance writer, do you find focusing on one specific niche market helpful when looking for jobs? I’m very new and so excited/anxious it’s hard to narrow down exactly what I’d like to focus in. Are some niches better than others and if so, where is best to focus? That’s why it’s important to treat your blog like a client. I like your suggestions of keeping a list of prompts. Having a few topical ideas is a great way to keep the blog going. I also write all my posts a month in advance. That way I don’t have to worry about meeting a deadline and keeping up with my blog. As a freelance writer, I don’t concentrate on one niche, but I do concentrate on my specializations. I find most freelance writers have several niches but maybe one core specialization. For me, that’s parenting, but most of my client work is with health, lifestyle or marketing. So, it goes to show, that you don’t always get work in your “wheelhouse.” Learn to adapt and decide what your specialization is. Form there, you can branch out if you find you can’t find plentiful work in your specialization. Thanks, that helps clarify quite a few thoughts! I really appreciate your feedback. No problem Jess! Feel free to sign up to my newsletter (you also get a free awesome eBook) to get started on freelance writing! It is amazing how much consistency and persistance can accomplish! I have chosen to post once a week because I can be consistent that way. And my blog sometimes has heavily researched health posts. I think sometimes people need to be able to digest that and think over whether it applies to them. Thanks for stopping by! Yes, I also post once a week as I do have other obligations such as my client work and my never ending eBook I’m trying to write! Blogs are definitely a great way to set up your own business, whether or not it’s freelance writing or cooking delicious recipes. I know that if you have a stellar blog with some awesome content, prospective clients will contact you regardless if you are a freelance writer. Great article, full of good ideas (and lots of them). Thanks for leaving a comment on my blog. Glad you enjoyed all my ideas! Using your blog to attract clients is easy to do. You just have to make sure to take the time to make your blog the best it can be! Great advice, Elna! I’m not currently looking for freelance work because I’m writing a novel. But when I’m in a place where I can write for someone else, it will be good to have my blog already in good shape for that. Congrats on writing a novel! I’m in the process of writing an eBook (non fiction), but because of client work, it’s taking much longer than anticipated. But, I’m okay with that. I really enjoy freelance work and it’s exciting to help a business prosper. Thanks for stopping by and leaving a comment. I’ll be sure to visit your blog! Great blog post, so sorry it took me awhile to read it! No worries if it took you a while to read it! That’s a good sign that you’re a busy freelance writer! I’m working on getting all my blog posts written for the this month! Just two more to go (March is a long month!). I bet I have read over 200 blogs in the last few months and you are so right on one point in particular… inject some passion and interest in your blog. If we are going to convert anyone from being a reader to a prospect and then a customer we have to persuade them and give them a reason to buy. Our words are powerful and people can feel us through them; and we all know that people buy based on emotion; not logic. Yet, blogs tend to appeal to logic. Why not blend logic and emotion together in your words. Let people both understand and feel you and then you’ll have a winning combination! I really enjoyed your article Elna. You definitely sparked a few ideas for me. Glad you enjoyed my article. I feel clients want a writer that can engage with readers, spark interest and ultimately convert. A blog can showcase some of these aspects for a freelance writer. If you have a consistent blog schedule, comments and shares, it can show to a prospect your level of influence. 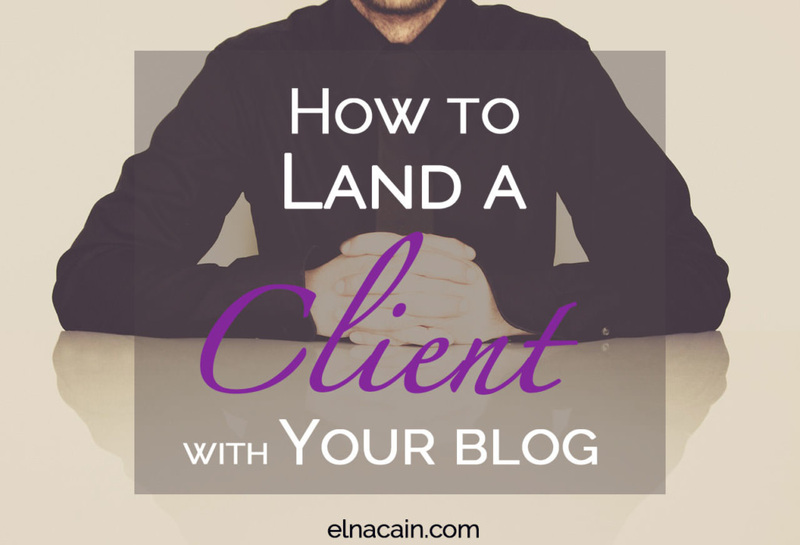 I agree, you should treat your blog like a client. I wouldn’t want to advertise that I’m a blogger, but not have an active blog – might not look good;-) I thought your interview series was super creative and fun to read! Thanks for being a part of my Confessions of a Freelance Writer series! I enjoyed doing it. Yes, having an up-to-date blog seems to go hand-in-hand with being a freelance writer/blogger. It’s like having a dentist with bad teeth! Just doesn’t make sense! This is really good information. I often find myself struggling with what topics to write about in my blog. Writing with passion doesn’t always come easy, especially when it seems I have to write for a niche’ and I’m afraid if I put too much personality into my blog it won’t be taken seriously by a prospective client. It’s sometimes hard to come up with blog posts on a consistent basis. I find that if I look to Pintetest or LinkedIn I can come up with some ideas. As for passion, I think if you show your readers you’re passionate it won’t hurt your chances of landing a client. My business blog is always something I’ve struggled with. I used to feel like every post needed to be something amazing and 100% unique, and I would never feel like I had anything good enough to write about. Then I realized that if I just wrote content that was useful and targeted for my audience, then writing about it from my own point of view made it unique. Each post doesn’t have to be earth-shattering. I’ve also struggled with posting regularly since my business has picked up last year. I always tend to put client work first, and all my own projects end up on the back burner. “Treat Your Blog Like a Client” is excellent advice, and lately I’ve been experimenting with exactly how I can put that into practice. I love your blog! It does have useful info that is unique. For me, I don’t mind doing a topic that’s already been done because I know I’ll have my own angle on it making it unique and helpful. Yes, it is hard to keep up with your blog when you have lots of client work. But, I try to carve some time to pump out a months posts so then I don’t have to worry about them.